What is the L300 Foot Drop System? 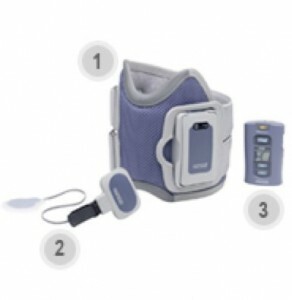 The L300 Foot Drop System is a revolutionary medical device that may help you regain mobility and independence. The system’s gait sensor adapts to changes in walking speed and terrain, allowing you to walk easily on stairs, grass and carpet. Comfortably worn under most clothing, the L300 Foot Drop System’s unique design can help you eliminate the need for a rigid ankle-foot orthosis (AFO), or braces, and may reduce the risk of falls and injuries. The L300 Foot Drop System is programmed by your clinician to stimulate the appropriate nerves and muscles in your leg to lift your foot and help you walk more naturally. The L300 Foot Drop System has adaptive wireless technology that senses when your foot is on or off the ground and automatically adjusts to changes in walking speed and terrain. The system delivers electrical stimulation in a precise sequence, which then activates the muscles to lift the foot to take a step. The result may be a more natural walking pattern (gait) combined with enhanced stability and confidence. The L300 Foot Drop System has three main parts that use wireless communication to “talk” to each other. The leg cuff is a small, light-weight device that fits just below the knee and contains electrodes which deliver stimulation where it helps you most. Available in two sizes: regular and small (for individuals with calf circumference approximately 12 inches or smaller). The gait sensor attaches to your shoe and lets the leg cuff know if your heel is on the ground or in the air. The hand-held remote control lets you adjust the level of stimulation and turn the unit on and off. The controller can be carried in your pocket, bag or purse.